Jake Browning, Derrick Henry, Tren'Davian Dickson among those with best prep single season efforts. See the 2015 Heisman Trophy winner back in high school at Yulee in Florida. With 68 touchdowns on the year, Charlie Spegal of New Palestine is on the verge of setting a possible national prep record for touchdowns in a season in what is becoming one of the great single season performances of all-time. Which begs the question, what are the greatest single season performances in high school football history? MaxPreps takes a look at the top 50 single season performances of all-time, based on the statistical magnitude of the performance, the setting of national records, the longevity of those records and whether or not the performance led to significant team accomplishment. Stat line: 5,790 yards, 91 touchdown passes, 360 completions, 524 attempts, 7 interceptions. Although Browning did not set any national records (he tied one), the entirety of his senior season at Folsom proved to be a crowning achievement in a spectacular three-year career. His 91 touchdowns tied a national record set seven years prior by Corey Robinson of Paducah. They also helped him set the national career touchdown pass record of 229. 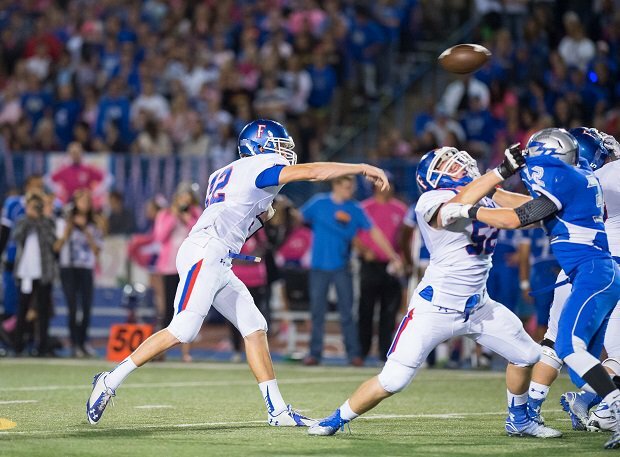 He threw at least six touchdown passes in 11 of Folsom's games. His 5,790 yards passing ranked No. 1 in state history (Browning had the top three single season performances by the time he graduated) and thus his 16,775 career passing yards were easily a state record. In fact, his career total was nearly 5,700 yards greater than the previous record holder. His completion and attempt totals helped him finish with state career records of 1,191 completions and 1,708 attempts. To top it off, Browning led Folsom to a 16-0 record and a California record 915 points. Folsom defeated Oceanside 68-7 in the Division I state finals with Browning throwing six touchdown passes and rushing for one. Stat line: 5,872 yards, 91 touchdown passes, 383 completions, 520 attempts, 4 interceptions. Robinson might have the No. 1 single-season performance of all-time if not for one small factor — Lone Oak lost in the state championship game to Lexington Catholic. Otherwise, Robinson had a season for the ages. He threw 91 touchdown passes, which surpassed the previous record by 14. He threw at least six touchdowns 10 times and four times he threw eight. He also had just four interceptions on the season, including none in the final 10 games of the season. His 5,872 yards set a state record and was No. 2 on the all-time national list at the time. His 383 completions also ranked No. 3 all-time nationally at the time. Lone Oak improved on a 5-5 record in 2006 to finish 14-1 in 2007 behind Robinson's play. A receiver as a freshman, Robinson threw for just 2,658 yards and 29 touchdowns as a junior before erupting as a senior. One aspect of Giannantonio's sophomore season at Netcong is not up for debate. He had a spectacular year, averaging 30.8 points per game while setting a state record for points in a season that stood until the 1970s when New Jersey instituted postseason play. He scored nine touchdowns three times and he reportedly ran for 750 yards in one game (or 739, depending on the source). His point total is well documented during Netcong's 8-0 run in 1950. Not so well documented is Giannantonio's rushing totals. Game by game rushing totals were not included in game reports and essentially didn't appear in print until years later. The NJSIAA didn't keep a record book at the time (it still doesn't) so the records were left up to newspapers to determine. Giannantonio's mark also didn't appear in the National Federation of High Schools record book until nearly 40 years after it happened. Nevertheless, Giannantonio's mark is recognized as the national record and it has only been seriously challenged once in the past 68 years. Stat line: 462 carries, 4,261 yards, 55 touchdowns, 336 points. In August 2012, a Florida running back was seen as a possible threat to Ken Hall's all-time career rushing record, but it wasn't Henry. Kelvin Taylor of Glades Day was thought to be the favorite to break Hall's mark of 11,232 yards while Henry was 3,369 yards away. Considering Henry hadn't rushed for more than 2,788 yards in a season, Taylor seemed like the best bet. That changed in the fourth game of the season against Andrew Jackson when Henry carried 45 times for 510 yards. He added three more games of over 400 yards and had eight total games with more than 300 yards. He broke Hall's record with a 57-carry, 485-yard effort in a 41-26 playoff win over Taylor County. Hall held the career rushing record (11,232 yards) for 59 years thanks in large part to a senior year where he rushed for 4,045 yards and led Sugarland to a Class B regional championship (Class B didn't play for state titles then). Hall was thought to have set the national record for rushing yards in a season with his total and it was reported as such for about 30 years before John Giannantonio's 4,756 yards was reported to the NFHS record book. Hall also set the single-season touchdown and scoring records in 1953 with 57 touchdowns and 395 points. Those totals finally fell 35 years later. Hall also set the national career scoring record with 899 points breaking the previous mark by nearly 230 points. Heading into the Class 1-AA state championship game against Wallace-Rose Hill, McClendon needed three touchdowns to break Brett Law's national record of 66 touchdowns in a season. McClendon finished with seven scores in a 66-28 win and ended his career with national records for touchdowns in a season, touchdowns in a career (178) and points in a career (1,070). He also set state records for career rushing yards (8,969) and points in a season (428). While it's quite possible that Allen's touchdown record could fall after one season, his 72-touchdown performance rates high among prep single-season accomplishments. In breaking T.A. McClendon's record of 71, set in 2001, Allen scored at least three touchdowns in 13 games and had at least five in eight games. He needed two touchdowns in Tulare's NorCal Regional playoff game against Serra (San Mateo) to break McClendon's record and that's what he got to go along with 347 yards rushing on 27 carries, albeit in a 76-43 loss. Allen led Tulare to a 13-1 record and a Central Section championship. He also averaged 13.1 yards per carry by rushing for 3,336 yards on 255 carries. Kenton was in the process of developing its passing game under head coach Mike Mauk and his son, Ben, was the beneficiary. Using an empty backfield, Kenton threw on every down. The result was two straight state championships with Ben Mauk at the helm. He threw for a national record 5,770 yards as a junior and then squashed that national record with 6,540 yards passing as a senior. He also ran for 1,388 yards for a national record 7,928 yards of total offense. One of the few threats to Giannantonio's single season rushing record came from Bragalone, who fell 53 yards short in 2014. In the postseason alone, he rushed for 1,925 yards and 23 touchdowns. He ran for over 300 yards nine times and had at least four touchdowns 11 times. After catching 13 touchdown passes as a sophomore at Navasota, Dickson tripled that output with a huge junior season. He caught three touchdown passes in each of the first three games of the season and had surpassed his sophomore season total by game six with a four-touchdown effort. He tied Kirby Moore's national record of 35 in a 49-26 win over Liberty Hill in the state semifinals, and he put some distance between himself and Moore with a four-touchdown performance in a 42-35 state championship game win over Argyle. He also caught 90 passes for 2,163 yards and he eventually finished his career with 76 touchdown receptions, good for No. 3 all-time. Stat line: 5,526 yards passing, 65 touchdown passes. The 1998 season was a breakout year for quarterbacks as five of them surpassed the previous national record of 4,656 yards passing in a single season. None of them was better than House, however, who led Nitro to a Class AAA state championship with 10 touchdown passes in the championship game. His 5,526 yards passing was nearly 1,000 yards greater than the previous record holder. He also finished with 65 touchdown passes, which beat the previous national record, but finished second that season to Josh Floyd of Shiloh Christian (Springdale, Ark. ), who had 66. Ken Hall's touchdown and points records fell during Sheridan's run to a Class A state championship in 1988. Law was unstoppable near the goal line, as he had 55 rushing touchdowns, 66 total, and also booted 54 extra points and a field goal. His 453 points beat Hall's mark by 58 points. Law culminated the season with 301 yards rushing and five touchdowns in the state championship game. As part of the prolific pass-catch tandem that included quarterback Pat Haden, McKay set a national touchdown reception record that lasted for 28 seasons. It lasted as a California state record for 43 seasons. Gray made a run at Michael Hart's scoring records and Ken Hall's rushing record with a strong senior season that included a state championship. While he fell about 400 yards short of the career rushing record (10,889 yards), he moved past Hart and finished with a national record 205 touchdowns after scoring 70 touchdowns and rushing for 3,910 yards. His 70 touchdowns fell one short of tying the national record for touchdowns in a season. Believed to be the first player to rush for over 3,000 yards, Roberts zoomed pass that milestone to finish with 3,690 yards while leading McMinnville to an undefeated season and a mythical state championship. He also finished with 41 touchdowns and rushed for 520 yards in one game. His single season total was a national record until John Giannantonio broke the record in 1950. Before he was a longtime quarterback in the NFL with the Buffalo Bills, Ferguson was a record-setting quarterback at Woodlawn. 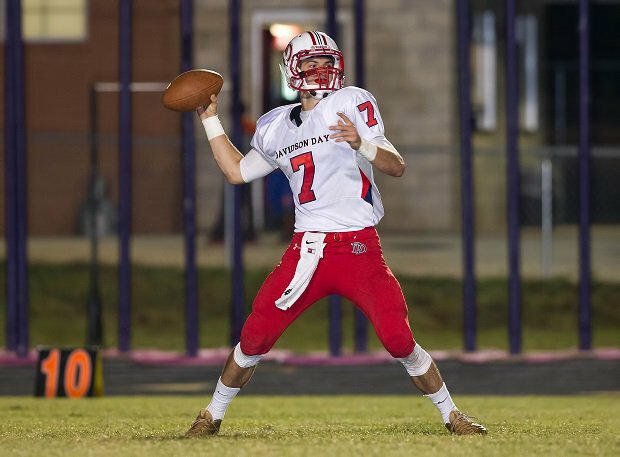 He led his team to an undefeated season and a state championship and he is believed to be the first high school quarterback to throw for over 3,000 yards with 3,293. He concluded his career as the all-time national leader in career passing yards with 6,710 and 86 touchdowns. Martinez set national records for receptions in a season and receiving yardage in a season while helping Wilson win a Los Angeles City Section championship. His receptions record lasted over 20 years before finally falling. Before Derrick Henry, Michael Hart was the biggest threat to breaking Ken Hall's career rushing record. He finished with 11,045 yards in four seasons at Onondaga, including 3,489 yards his senior season. He also broke the career touchdown record by over 50 touchdowns, finishing with 204, after scoring 67 touchdowns his senior season. When Ebell passed Travis Henry on the single season rushing list, he was proclaimed the national record holder by the Los Angeles Times (Giannantonio's record was not known at that time). He finished with 4,494 yards and 64 touchdowns while leading Ventura to the Southern Section Division IV championship. Leon had one of the most prolific passing attacks in the nation in the 1970s. Wally Woodham set the national record for passing yardage in a season with 3,511 in 1974 and the very next season Jordan smashed the record and became the first prep to ever throw over 4,000 yards in a season while leading Leon to the state championship game. Arkansas has produced some of the most prolific passers in the nation with Josh Floyd of Shiloh Christian (Springdale, Ark.) setting the national touchdown pass record with 66 in 1998 and Thrash blowing away the record in 2001. The first in what has become a long line of great quarterbacks at the Little Rock school, Thrash beat the old mark by 11 touchdowns and even had 10 touchdown passes in one game. His 5,272 yards set an Arkansas state record. Grier had several outstanding seasons, but we will go with his junior year when he set a national record for passing yards in a game with 837. He also had a national record 99-yard touchdown pass and threw 10 touchdown passes in a 104-80 win over Harrells Christian Academy. His 5,785 yards ranked third all-time (currently seventh). Only two quarterbacks have ever thrown for over 6,000 yards in a season and they've both been coached by Mike Mauk. One was his son Ben at Kenton (Ohio) and the other was Huston at Glendale. Huston threw for at least 400 yards in 11 straight games (he had 341 in his only other game) with a high of 706. Toledo Waite was a powerhouse in the 1920s, winning a national championship in 1924. In 1921, however, Berndt had a season that no Ohio running back would top for nearly 100 years. His 333 total points lasted until 2016 — a total of 95 years — before Daniel Bangura broke the record. In many ways, Sherman's season totals are better than Jake Browning's, who tops this list. In the same season as Browning, Sherman had more yardage (his total ranks No. 3 all-time), tied with Browning (who did it in 2013) for a national record in completions at 440 and ranks No. 4 all-time in attempts. Browning, of course, had the big edge in touchdowns (91-65) and won a championship while Sherman lost in the semifinals. Few players have carried the ball as many times in a season as Melesio, who twice carried 55 times in a single game en route to a California state record 478 carries. His rushing total fell 36 yards of the California state record, but ranks No. 4 all-time nationally. Overstreet made a run at MClendon's national single season touchdown record by scoring at least three touchdowns in every game he played and scoring at least four in 12 games. He also ran for 4,259 yards, which was the fifth-highest single season total ever. For many years, Henry was thought to have set the national record for rushing yards in a season when he surpassed Hall's mark of 4,045 yards in 1996 (Giannantonio's record was eventually published in the National High School Record Book by Doug Huff in 2001). Henry rushed for 328 yards in the championship game against Union County to surpass Hall. He broke the Florida state rushing record by over 1,100 yards. Sadler fell two points short of Law's single season scoring record, scoring 61 touchdowns, but also adding six two-point conversions and 70 PATs and a field goal. He also proved to be incredibly durable on the field, carrying the ball 50 and 51 times in back-to-back games en route to 3,887 rushing yards. Davis upped the national passing yardage record by nearly 300 yards, breaking Lupe Rodriguez's record in 1990. He also edged out future Heisman Trophy runner-up Heath Shuler for the Associated Press Player of the Year honor in North Carolina. After Jimmy Jordan threw for 4,098 yards in 1975, it took another 12 seasons before another high school quarterback threw for over 4,000 yards. Lupe Rodriguez broke state and national records for passing yards in a season with his 4,179-yard effort. His 50 touchdowns also ranked as the No. 2 touchdown pass total for a single season. With Kellan Luker throwing him the ball, Cardwell set a national record with his 2,427 receiving yards. He was so dominant in the state of Texas that year that no other receiver was within 1,000 yards of his record total. Cardwell helped Stephenville win the Class 4A state championship and set a state record for total offensive yardage at 8,641 yards. Big Sandy had one of the greatest offensive seasons in prep football history when it scored a national record 824 points in 14 games to win the Class B state championship. Overstreet was a huge part of that success, scoring 56 touchdowns and averaging over 21 yards per carry. Evangel Christian has had a number of outstanding quarterbacks, including Josh Booty and Brock Berlin, but it was Phillip Deas who broke the national passing yardage record in 1996 when he threw for 4,656 yards. Berlin nearly broke the record a year later with 4,654 yards, and he did surpass it in 1997 with 4,834 yards, however J.R. House set the new mark in 1998 with 5,526 yards. Todd set the national record for touchdowns in a season, breaking Berndt's record of 51 touchdowns in a season. His record lasted 19 seasons until Hall scored 57 in 1953. Shohfi set the national receiving yardage record with a strong push through the playoffs, including 197 yards in the state bowl game against Central Catholic. He also had 282 yards and 232 yards in the two previous playoff games and had a high of 300 yards early in the season. Moore became the most prolific touchdown receiver while playing for his father Tom Moore at Prosser and his 95 career touchdown receptions is 12 more than the No. 2 player on the list. He culminated his career with a then-national record 34 touchdown catches in 2008. Playing in the Kenton passing offense with all-time career national passing yardage leader Grant Sherman as his quarterback, Sawmiller set a national career receptions mark with 445 catches thanks to a 158-catch season. Sawmiller also finished third all-time in receiving yardage with 6,277 yards. His 158 catches rank second all-time. There was speculation in 2012 that Newsome might become the first player to break Hall's career rushing record of 11,232 yards. While Derrick Henry beat him to it, Newsome made a strong run at the record in 2013. He carried 333 times for 3,867 yards and 68 total touchdowns in leading Ansonia to a 15-0 record and a Class S state championship. He finished his career with 10,685 career yards. Bangura had a huge season as a senior, rushing for 3,401 yards and scoring 322 points, but it was his junior year where he makes this list. In breaking a 95-year old state scoring record with 336 points, Bangura also broke the touchdown mark that had stood for over 65 years. He also broke the state single season rushing yardage mark with 4,128 yards. Glenn set the national single season scoring record, breaking the mark of 333 set by Cully Berndt of Toledo Waite in 1921. Glenn's totals included 10 touchdowns in one game. His 359 points remained a single-season record until Ken Hall broke the record 31 years later with 395. While Harold "Red" Grange is considered one of the greatest players to come from Illinois in the 1920s, he didn't set a national record for single season touchdowns during his time at Wheaton. That honor went to fellow Illinoisan Zinser, who scored what we believed to be a national record 43 touchdowns in 1920, including 10 in one game against Clinton. His state record stood for nearly 70 years. One of the greatest threats to Law's scoring record came in-state from Smith oin 2000. He went into the state championship game against Adams Central needing 16 points to tie Law and he finished with just 12, giving him 449 points on the season. He ran for 230 yards on 42 carries in the game to give him 3,004 for the season. Barket became the first running back since Tyler Ebell in 2000 to go over 4,000 yards in a season. While leading Schuylkill Haven to a 14-1 record, he just missed the national touchdown mark after scoring just one touchdown in a state final loss to Steelton-Highspire. Before he was a Super Bowl hero for the Green Bay Packers, McGee was the first Texas running back to rush for over 3,000 yards in a season. Also a standout punter, he average 43.7 yards per kick. He also added 17 interceptions on defense. What makes McDonagh's reception total even more amazing is that he accomplished the feat in 10 games. He had at least 19 receptions four times with a high of 25 catches. 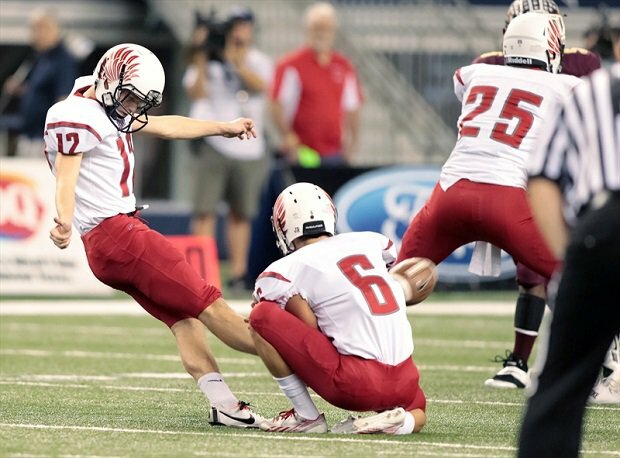 As a senior, Hedlund just missed breaking the national record for field goals in a season with 24. However, he still held the national mark since he set it as a sophomore with 25 field goals. He finished his career with a national record 56 field goals. Kline's stats don't look like anything out of the ordinary until you look at how he scored his 50 touchdowns. He scored 32 touchdowns on rushes, five touchdowns on receptions, a national record nine touchdowns on punt returns, two touchdowns on kickoff returns, one touchdown on a fumble recovery and one touchdown on an interception. That's 13 total touchdowns on returns. Moore's offensive output might not seem like much, but add in his 21 interceptions on defense and you have a tremendous all-around performance. Moore picked off 59 passes in his career with the 21 coming his junior season. He also had seven of those interceptions in one game. He also rushed for 6,850 yards in his career. Fischbach set a national record for kickoff returns for touchdowns as he scored on 28 percent of the kicks he fielded. He had two games where he returned two kicks and he had two of over 95 yards.